Summer is just around the corner and that means the picnics and BBQ’s will be starting soon. You always have to bring something to share and the last thing I want to be doing as the sun beats into my kitchen windows is turn on the oven. I’ve got the absolute perfect patriotic, Fourth of July or Memorial Day dessert for you to share at that BBQ. 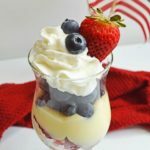 No Bake Fourth of July Parfaits! These are so easy to make and shouldn’t melt too much in the summer heat. It’s so hard to find a Fourth of July dessert that won’t melt but I think these should hold up nicely. First things first, the ingredients. As you can see they really aren’t complicated at all. You’ll need two boxes of Jello Cheesecake instant pudding (you can buy the sugar free, fat free kind if you want to lighten it up a bit), milk, fresh blueberries, fresh strawberries, and whipped cream. Then place in them an adorable parfait glass! It’s all about presentation; just ask the interior crew of Bravo’s BELOW DECK. After you have all of your ingredients out and ready to go, whisk together the pudding mix and the milk for two minutes. After you’ve whisked for two minutes let the pudding sit for a few minutes to thicken up. While the pudding it thickening, cut the strawberries into quarters. I like to use this strawberry slicer. Sure it makes the strawberry slices thinner than quarters but if you’re serving this to small children it does make it easier for little mouths to chew. Then add a layer of strawberries to your parfait glasses. The more strawberries you add to the bottom the better that red color will show through. Then add 3/4 cup of the pudding on top of the strawberries. Add a layer of blueberries on top of the Cheesecake pudding and then chill the parfaits in the refrigerator until you’re ready to serve. After you’ve chilled the parfaits and are ready to serve them, top it all off with whipped cream and voila! You’ll be the hit of the party. What kind of glass or dish do you serve a parfait in? Parfaits are meant to be small servings but you can always make a large parfait. Since this is such a great BBQ and picnic consider using plastic parfait cups. In a large bowl, whisk together pudding mix and milk for about two minutes. Let stand for a few minutes to thicken. In your parfait glasses, add a layer of strawberries to the bottom- the more the better to get a good layer of red at the bottom. Add about 3/4 cup Cheesecake pudding mixture to your glass. Follow with a layer of blueberries. Chill in the refrigerator until ready to serve. Before serving, top with whipped cream and a few extra blueberries for garnish. Enjoy! These are so easy to make and shouldn’t melt too much in the summer heat. It’s so hard to find a Fourth of July dessert that won’t melt but I think these should hold up nicely.